What type of gift would you present yourself on your own birthday on your own self? And what would expect from your subordinates or your grandchildren to bring you on your birthday. Especially if it is your 50th birthday? Well, what the automakers do to commemorate their company’s anniversary or to rejoice the life of a car living since long? Certainly, they bring in a limited edition high spec model that surceases the actual version. And everyone starts desiring to get one of those. Well, this is not a patent set by a company. Though it was launched by an automaker it never came under a copyright act. Instead, it served as a legacy. And every next year there is a special version launched into the market to commemorate the life of a long living company or an old model that is still active. In the past year, Nissan announced that it would be celebrating the 50th Anniversary of its legendary GT-R. In 2019 the Nissan GT-R completed its 50 years of life. Some of what had been spent under the shadow of the succeeding actual brand. While most of what has been spent as a pure separate model. Well, to bring all the happiness to life, Nissan unveiled the GT-R50. This car is not actually based on the actual GT-R. Instead, it gets most of its parts from the NISMO edition GT-R. Well, it has nothing much to do with the roots of this car. Indeed, it has power, it can perform and it can outrun a lot of GT-R’s competitors. And even it costs a lot. 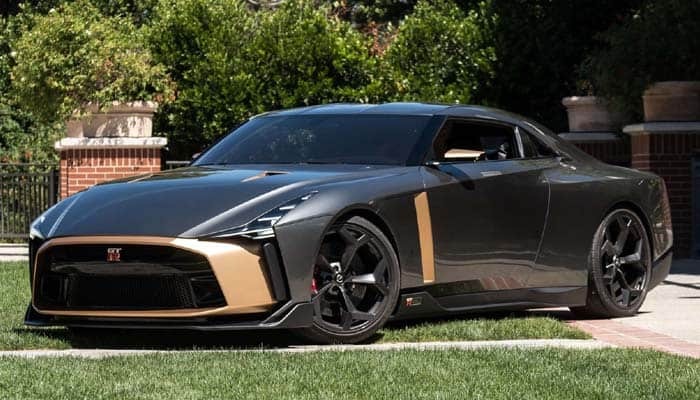 Well, the lowest price so far recorded for a Nissan GT-R50 is around $1.05 million. Would you buy such an expensive car? Nissan used the same GT-R NISMO concept to build the mechanism of this car. In a way, the GT-R50 has borrowed everything from its NISMO sibling. The only different aspect is the power rating which makes the GT-R50 stand a bit different than the other models of the GT-R series. Well, the 3.8 L twin turbo V6 takes the pride to ride run the mechanism. The estimated power rating for this car is around 710 hp with 575 lb-ft of torque. That is 110 hp more than the GT-R NISMO edition. Even the torque is around 96 lb-ft more. Further, the powertrain is coupled with the same 6-speed dual-clutch automatic transmission. 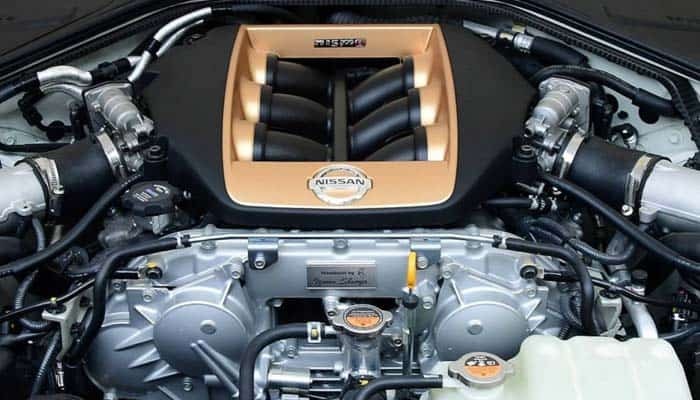 With this much power rating, we expect the GT-R50 to roll 0-62 mph within 2.4 seconds. And the expected top speed would be around 200 mph. 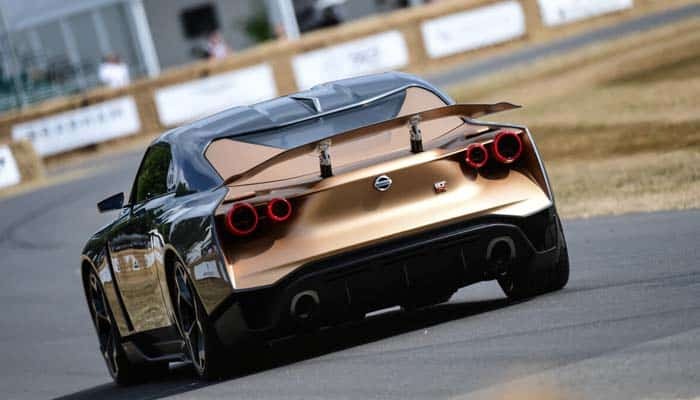 Yet a complete test is to be made once the GT-R50 is formally available by Nissan. Ahead of that, the Nissan GT-R50 comes equipped with the all-wheel-drive configuration. Certainly, the handling rates better than the remaining GT-Rs. Especially the steering ability would be far better than the other models. Even the big brake system adds more fuel to the stopping capability of this car. Overall, there is just a minimal difference in the performance of the GT-R50 and the top GT-R trim, the NISMO. Besides, the rest of the mechanism is almost similar. The whole difference lies in the styling. The Italdesign designed the exterior structure of this car. Well, they have revamped the whole structure, giving it an entirely new look. Along with that, the aerodynamic features have been vitally improved in the design. And to do that, the Italdesign borrowed different concepts from the motor-sporting versions of the GT-R. Such as the rear designing including the wing has been copied from the GT3. Further, the cosmetics include the LED lamps, 21-inch alloy wheels, and the Michelin Pilot Super Sport tires. Ahead of that, the Bilstein suspension adds more ability of damping to this car. The interior as well gets some drastic improvement. But it is not much different than the setup found in the rest of the models. 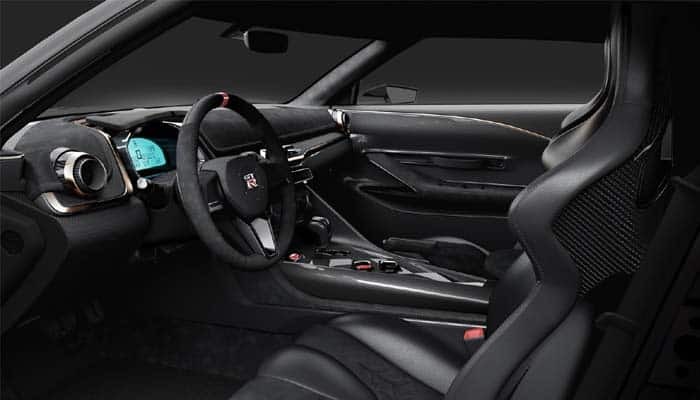 Well, here you would get carbon fiber finish, Alcantara black leather on the seats and gold and black accent all over the door sills and over the cockpit. Further, sports seats cover the interior compartment, with spacing available only for two. And the trunk appears to be shy to carry anything. So far it seems like Nissan has spent all the fortune on the exterior design of this car. While inside tech is not so cool in the base ingredient. 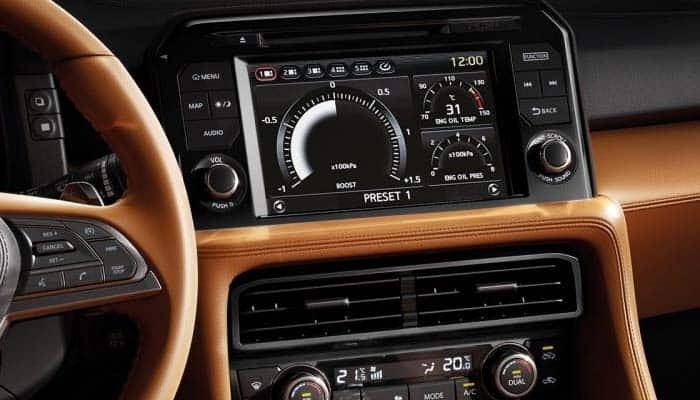 The infotainment touchscreen is available optionally. Besides the base trim gets the old fashioned stereo player. Further, the steering wheel does not get control mounted on it. The only tech-savvy material included is the digital driver cluster display with some configurable options. While the navigation, mobile app support and the performance recorder is available only on demand. They do not come standard in this car. Under the safety column, the GT-R50 gets all the passive safety equipment essential. It has airbags for the driver and the other occupant. And the seatbelts are pretty fine. While the active safety features include the anti-lock braking system and the electronic brake force distribution. Ahead of that, the driving dynamic features such as the tire pressure monitoring system, blind spot monitoring, and the other features are available optionally. 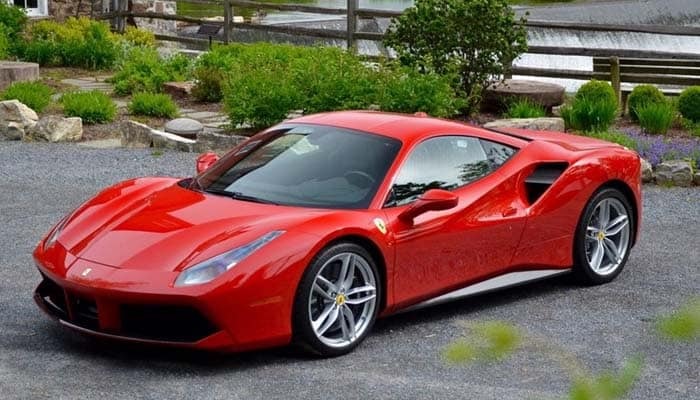 The Ferrari 488 Pista is the closest option available for the competition. It has a similar power rating and a similar performance expression. But it carries a couple of more cylinders under its hood than the GT-R50. 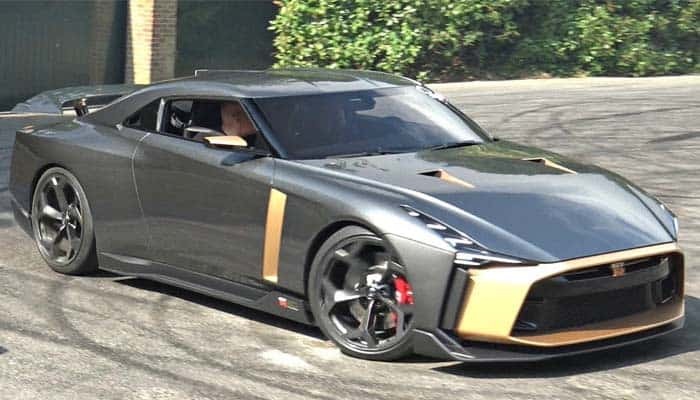 Well, the Nissan GT-R50 is certainly a dream car from its looks. And even if the performance caliber rates higher than the NISMO edition, it would cut off the fuel lines for a number of performance machines in the market. But there would only be 50 pieces of the GT-R50 produced.